Connections mattered to Lew Gaiter III. Whether it was forming a bond with nearly every person he engaged or hooking Larimer County, Colo. up to broadband internet, he wanted to find a way to connect and exchange ideas. Gaiter died at 58 years old Sept. 18 after a decade-long battle with multiple myeloma. He spent the last eight years as a Larimer County commissioner. “What I remember most were the relentless efforts he would make to make connections with people, engage everyone in discussions,” said Chip Taylor, executive director of Colorado Counties, Inc. “It was a product of who he was — someone who always tried to connect. It made him effective as a Larimer County commissioner, it made him effective as a member of CCI, and it was part of what made him effective with NACo. 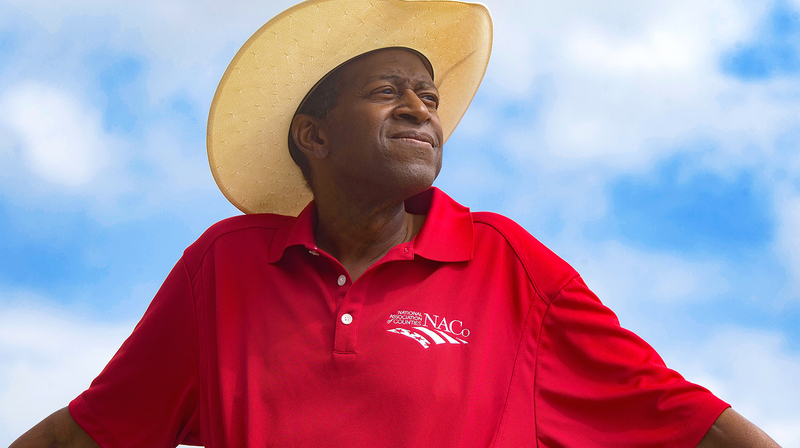 Nearly all of his career in government included service to NACo: on the Community and Economic Development, and Telecommunications and Technology steering committees. He also served as chairman of the Information Technology Standing Committee from 2016–2018. He served as CCI president 2017–2018. After a career in software engineering, Gaiter considered running for the Larimer County Board of Supervisors in the 2000s. He was appointed to the Board in 2010 and then won elections that year and in 2014. Gaiter was renowned for his in-depth conversations and discussions, and credited his parents with encouraging him to be open and thoughtful. Cooke County, Texas Judge Jason Brinkley saw that when the two served together on the NACo Telecommunications and Technology Committee. Brinkley said Gaiter’s technology career made him a natural fit for his NACo committees, and he was passionate about broadband access in rural areas, net neutrality and FirstNet. “He was one of the most kind and diplomatic people I’ve met,” Brinkley said. As a Larimer County commissioner, he pushed for the creation of the county’s department of economic development and office of emergency management, was instrumental in the development of the county’s Innovation Awards program and advocated for a five-year strategic plan process. His record as a commissioner formed the basis of his platform when he ran for the Republican nomination for governor in 2017. Taylor said Gaiter’s run was a great boon for the state’s counties because his credibility forced his opponents to focus on local governments. Gaiter was the father of nine, an active ski patrol volunteer and a rabid Denver Broncos fan. CCI President Dave Paul, a Teller County commissioner, called Gaiter a man of strong faith who valued his family, his friends and his community, giving limitless attention to improving the lives of those around him. Even when he wasn’t feeling his best, he never complained and consistently delivered sound judgement and advice to those he worked with at CCI.